We have started learning simple addition, so I came up with a simple game my kiddos could use on their own to help them develop the idea of putting 2 groups together. We first used the 5 frames and dice. The kiddos would roll a die and place that many of one colored cube on their 5 frame. They would then fill in the rest of the spaces with their second color. They then turned to their partner and would say “2 blue and 3 green make 5.” Then it would be the other kiddos turn. I numbered the die from 0-5 so that they could not roll more than 5. We spent a day playing each of the ways mentioned above and then another two days playing the same games but with a recording sheet. I got the recording sheets from my Math Their Way blackline masters. 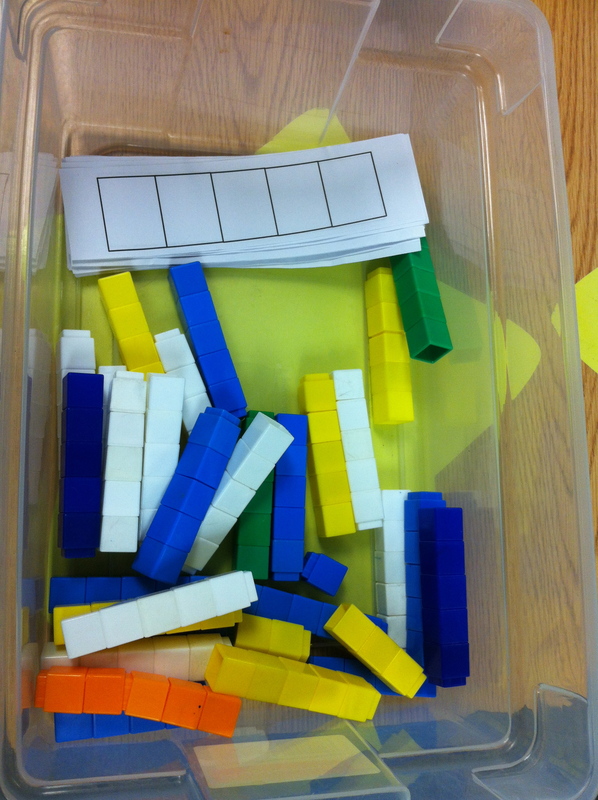 It is a 1/2 page with 5 cubes linked together. The children had to color their recording sheet to represent the cubes on their 5 frame. The 2nd way we will be using our 5 frames is during our Literacy time next week. Part of what we are doing to develop literacy skills is counting the number of words in sentences. The children will each get a 5 frame and a stack of 5 cubes (none of the sentences will have more than 5 words in them). 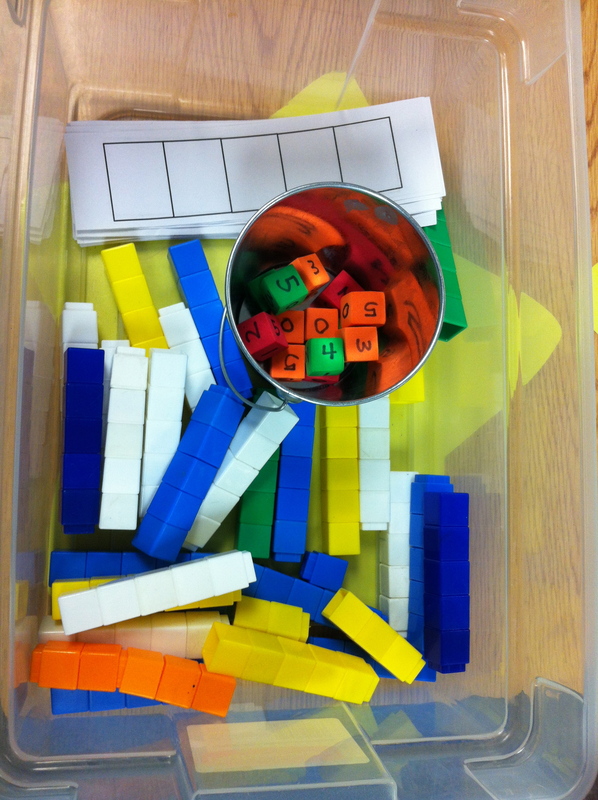 As I say the words in the sentence, the children will place a cube on their 5 frame for each word they hear. You could also use these to count sounds heard in words. How do you practice addition and subtraction with your kiddos? What materials do you use? Sorry that I’ve been a little absent lately…I worked really hard during at least 5 days of my winter break so that I could come home from school for a few weeks and just relax! I have some pictures that I’ve been taking and will get those posted later this week, but today, while watching the Inauguration, I worked on this set for Valentine’s Day/February Math Work Stations. It’s a set of 5 activities that are quick and easy to set up and get going! 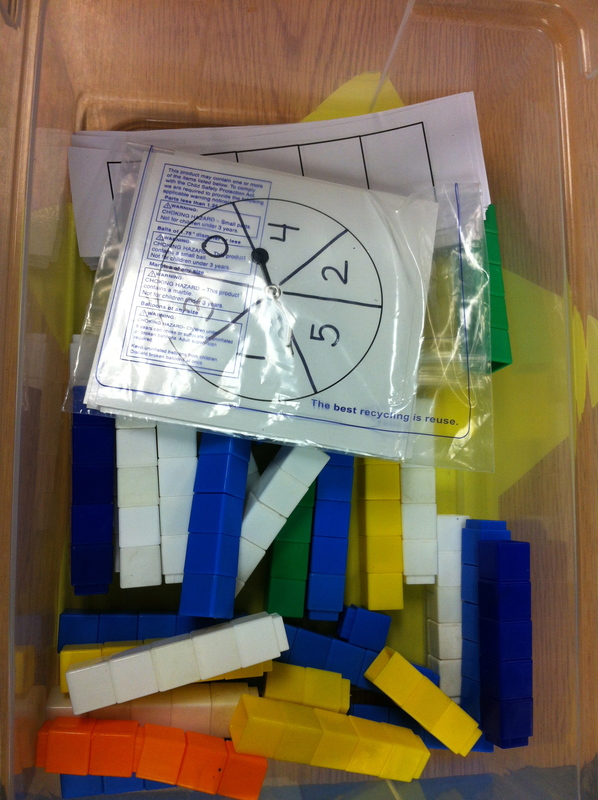 I’ve included all the manipulatives you might need, but you can add your own if you want to. I found pink and red heart shaped table scatter at the Dollar Tree this weekend and some foam Conversation hearts from the Dollar Tree and in the Target Dollar Spot. I plan on using them with these activities in my classroom, but I will let the kiddos have the real Conversation hearts when we sort and graph them on the sheets included in this pack. Two different kinds of patterning cards are included and a recording sheet is included so the children can record their patterns. I’ve also added a Valentine’s Day “Make ____ on the Ten Frame” that is very similar to the winter and fall themed ones I have created before. I also put in a “How Many to 10?” game where children look at a Ten Frame with hearts in it and figure out how many more they need to make 10. There is a spot on the bottom of each sheet for children to write the corresponding math sentence. I’ve added a recording sheet for that activity as well, so using 2 different colors, students record combinations to 10. Today, I sat down to do my plans for January and after looking over my math data, I discovered that we need some more work with addition. I created these winter themed math mats so my kiddos could practice seeing the number sentences and practice writing them. When you use them, you will want to laminate them or place them in a sheet protector so your kiddos can use them over and over to practice. Just use a dry erase marker and a sock (to erase) and you’re all set! Here are some more pictures of our newest Math Work Stations. 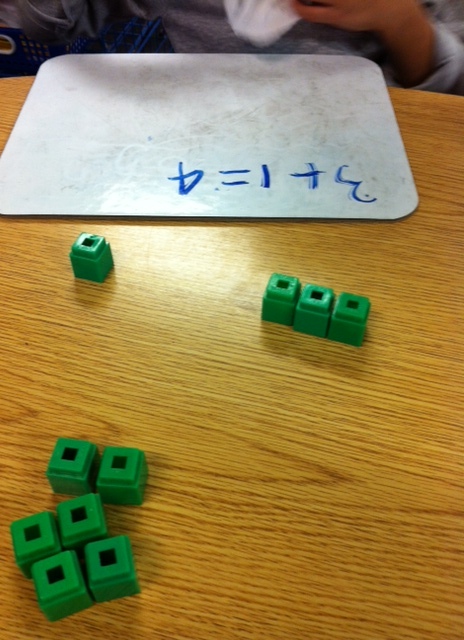 We’ve moved on to the 3rd quarter Math Common Core Standards (mainly addition and subtraction and 3D shapes). I’ve introduced a new puzzle that helps with addition and subtraction, some games about weight (heaviest/lightest), and a dramatic version of 5 Green and Speckled frogs to help with the idea of subtraction.